Last weekend I set out on another Iphone video adventure, this time canning tomatoes with one hand on the camera. I posted on Instagram and Facebook and the whole prep was finished in one hour. I know this is slightly crazy, and the videos are so completely amateurish and it would be better if there had been a videographer, but whatever. I’m having fun. All I want to do is encourage you to can up some tomatoes this summer and show you how easy it is. So, in a series of bouncy bumpy, goofy videos, available on Instagram and Mrs. Wheelbarrow’s Kitchen on FaceBook, I’ll show you the way. I tried to load them here, but technology won and I lost. It was just too complicated. I’ve said it before and I will continue to say it every year. If you do no other canning all year, can tomatoes now, while they are abundant and local. It will take three hours or so, a good part of it waiting for the canner. The more people the better – get your friends to help. One person can definitely crush 25 pounds. Two people can easily do 50 pounds and when you get three or four people, it’s a breeze to can 100 pounds or more. When all the tomatoes have been dunked, it’s time to get messy. Cut out the core, remove the peel and squeeze out the seeds and gel. Tear the meaty parts of the tomato into 2 inch pieces. Measure as you go. 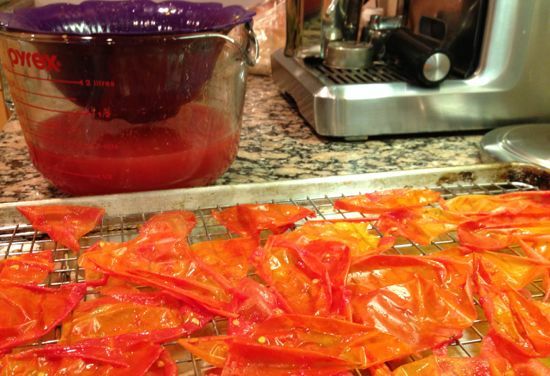 When four cups of the tomatoes are torn and prepped, add to a large, non-reactive pot (8 quart minimum). As each quart goes into the pot, crush the tomatoes with a potato masher. They’ll get juicier. Bring to a boil before adding the next quart of tomatoes. When all the tomatoes have been crushed and heated, boil the mixture for five minutes, continuing to crush with the masher. Ladle into the jars to a 1/2 inch headspace. Add 1/2 teaspoon citric acid to each quart (1/4 teaspoon to each pint). If using lemon juice, add 2 tablespoons lemon juice to each quart (1 tablespoon to each pint). Run a bubbler through and around the tomatoes, clean the rims of the jars, place the lids and rings and process in the boiling water canner for 45 minutes for quarts, 35 minutes for pints. 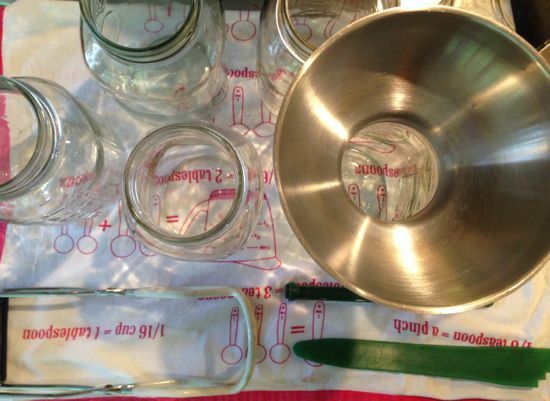 Remove the jars after processing, placing them on a towel on the counter and letting them cool entirely. Wash the jars well when cool and store in a cool, dark place for up to one year. Sounds so easy, even I could do it. But, what’s a bubbler? I just love that name!!! Is pressure canner an absolute esssential? If I water bath can tomatoes with herbs, salt, pepper, garlic & EVOO do I need to add lemon juice? I recently water bath canned ripe tomatoes just chopped & cooked without adding water. Did not add lemon juice. Are they safe? Should I bring to 240 degrees before consuming to kill potential botulism spores? Hello. There are several red flags in your comment. I’ll take them one at a time. 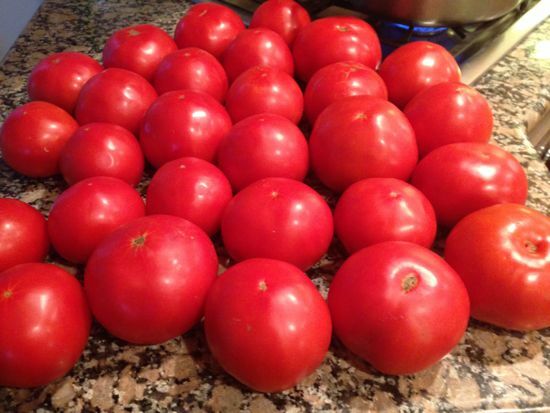 Pressure canning is faster and it is extra safe when canning tomatoes. It is possible to can tomatoes using the waterbath method, as you have been, but NEVER with the inclusion of EVOO, garlic or fresh herbs. If you want to use EVOO, garlic or herbs, you must use the pressure canner. 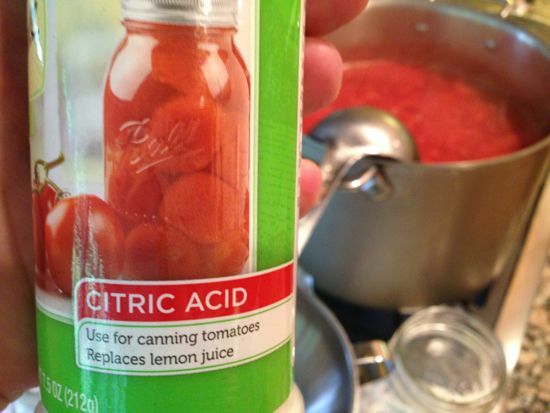 The tomatoes you canned without lemon juice (or citric acid) may not be safe. I can’t tell you whether or not they are safe to eat. But, you cannot boil away unsafe food born toxins after the fact. The system deleted the URL cited as reference for my comment. It was an article in Georgia FACES published on April 30, 2015. The article was by J. Calvin Powell citing Elizabeth Andress, director of the National Center for Home Food Preservation. why not can them whole? peeled stem top removed? Sure! Can them whole if you want. I like to crush them — more fit in the jar! I had to remember, and giggle, when, years ago, I planted 16 Roma plants, on a strip of city property between a Corvallis, Oregon sidewalk and the street, and canned 82 quarts from the effort. I would like to try this (first time canning tomatoes!) when my local tomatoes go on sale by the 25# box! I purchased some bottled lemon juice (Santa Cruz Organic Pure Lemon Juice) to can tomato jam and was told to use the bottled juice because the acidity is more consistent. Can I use the bottled juice in your recipe, and if yes, is the quantity the same (2T/quart or 1 T/pint)? Thanks for your help. I meant use the bottled lemon juice in place of the fresh lemon juice. Thanks. Yes, use the same amount of bottled lemon juice as fresh. I have a burning question about canning tomatoes. When I make sauce for my freezer I blacken the skins under the broiler for 3 – 5 minutes to remove them. Could I do this for canning the tomatoes as well? I prefer the flavour over a blanched tomato. This is my second year of canning, and while I assume it won’t change the tomato… better safe than sorry! Yes, absolutely you could do the same thing! I can quite a bit, but this was so easy that I was able to do a few pints on a busy weeknight…a new achievement for me. Thanks for all of your great articles in the Washington Post. I have been loving the regular dose of inspiration. We have bottled tomatoes for years, but lately we lose about a quart a batch to breakage. Sometimes as we put the jar into the water, the bottom breaks off. We have tried keeping the bottles hotter so there is not a big temp. difference. We have used brand new bottles, thinking some of ours were getting old and had hairline cracks. Still had the breakage problem. It has discouraged us from bottling this year. Have you run across this? Wow, that would discourage me, too! Are you using Ball jars or another variety specifically made for canning? I’ve had some jars break and have always assumed they were just old (I keep jars forever) but I’ve never had a rash of breakage like you. I’m assuming you use some sort of rack or padding on the bottom of the canning pot? Let me know the answer to these questions and let’s figure out the issue – I want you to have nice tomatoes in the pantry for the winter! I bought your book at once of your classes you held at the Smithsonian. I finally made my first batch of tomatoes and was all set to finish the canning process when I realized my pot wasn’t tall enough (doh!). 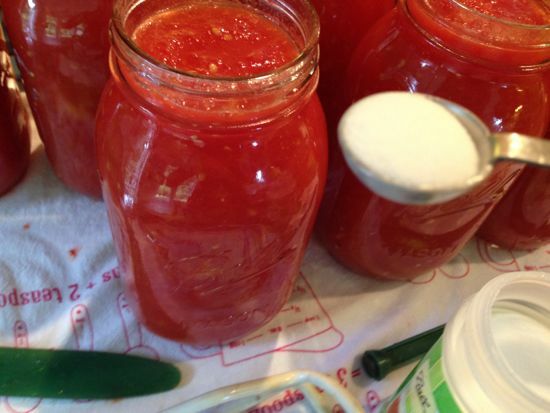 I had already put the citric acid in the tomatoes in the jars. When I realized that I needed to get a bigger pot, I emptied them back all together to re-heat the next day (within 24 hours). My question is, do I need to add more citric acid since I added enough for each jar? Thank you! Yes, do add fresh citric acid. You’ll be reheating the tomatoes before filling the jars and the power of the citric acid will be unreliable. Because it is tasteless, this will not affect the final product. Yay for canning your first tomatoes! Hi — when you say to add citric acid or lemon juice, do you add that amount to the whole mess and stir it in (proportional amount based on the size ofyour batch), or do you put it on the top of the jars, or mix it by the jar? Sorry, I have never done canning before! HI Cathy. I’ve been using your tomato canning recipe that was printed in our local paper (Minneapolis Star Tribune) since 2014. It was my first canning experience and I do it each year and love it–especially in January when I pop open a new jar. I had two questions though:Do you really need to seed the tomatoes? By doing that I seem to get rid of so much juice. Also my printed recipe says when skinning the tomatoes to plop it in the boiling water for “no longer” than 10-15 seconds, but when I do it for that short of a time, they don’t peel that easily. If you’re cooking them later, why does it matter? I do see that you’e changed the time here to a minute or two, so that question might be moot. Thanks so much!